Well, I had this grand plan about putting both quilts into one post, because they were made practically together, but I seem to have lost the photos of one of them, and as neither of them is currently residing with me, I sadly, must present an incomplete post! 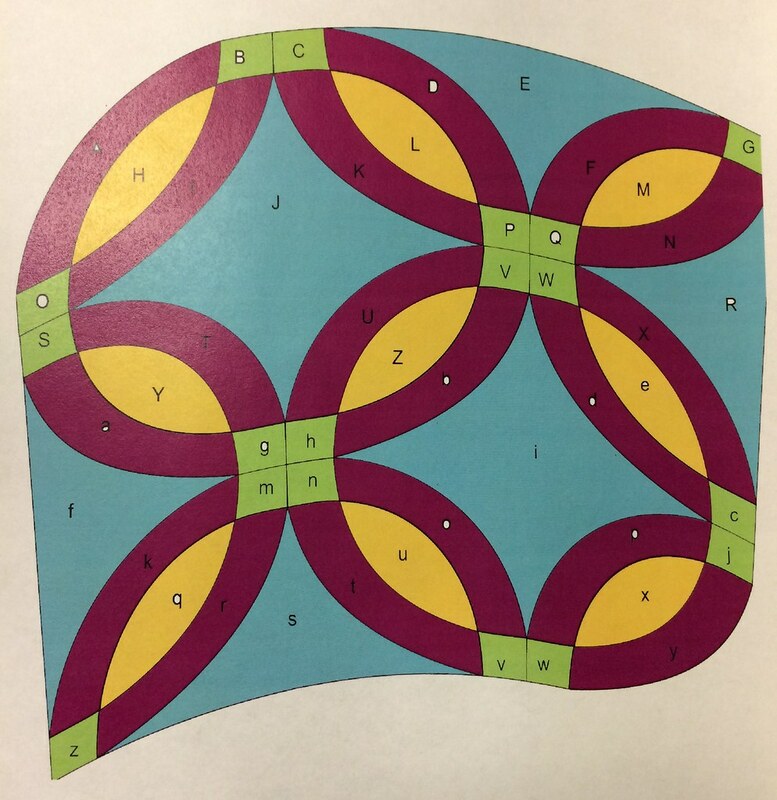 I had been thinking about double wedding rings since I saw Victoria Findlay Wolfe's curve piecing demonstration at QuiltCon 2015. 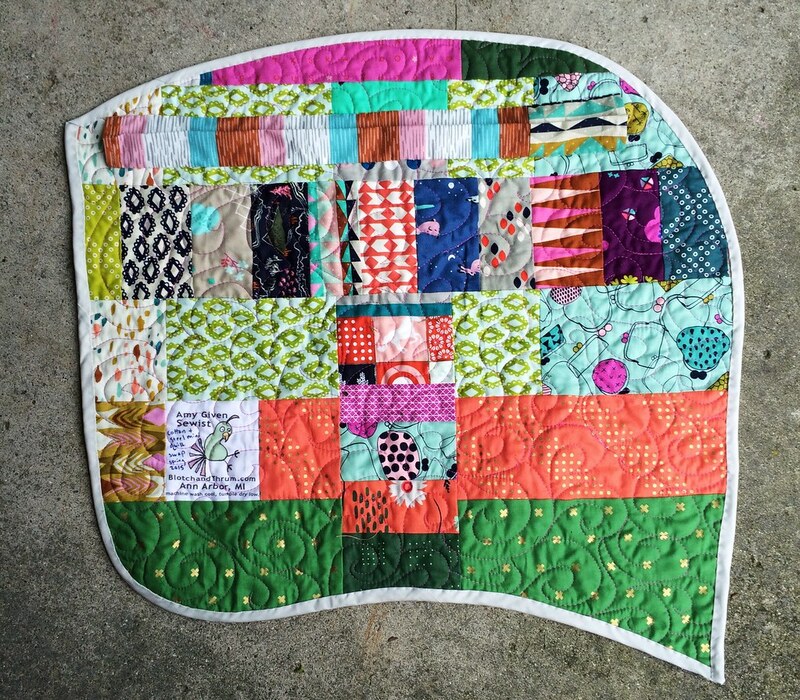 And my partner for the Cotton + Steel swap had a lot of mini quilts, and I was looking for an idea for something that would be very different from anything she'd received before. I had already downloaded this pattern, and I don't know why I decided that wasn't hard or different enough... But it wasn't. So, I imported a picture of a double wedding ring block into Illustrator and traced the shapes, then duplicated them until I had the number of rings I wanted, then used the warp tool to shift them around until it became a shape altered enough to look odd, but not so difficult to piece. Then I broke them into pieces, and added a 0.25" seam allowance using Daisy's tutorial on Ants to Sugar, and had a friend of mine with a 36" printer print them out. No two pieces being alike, and making two quilts at once, I would cut out the five pieces for each peel unit at a time, then assemble it, before moving on to the next peel. And it was not as bad as I expected to assemble, although the piecing looks more complex than a drunkard's path quilt, it's much more forgiving, because they are shallower curves. At the end of the piecing, I had two quilts, one I had to finish up and send off to Quilt Market quickly, and maybe never took pictures of, using Brenda Ratliff's Pie Making Day fabric, and one for my Cotton + Steel swap partner, using Cotton + Steel fabrics. 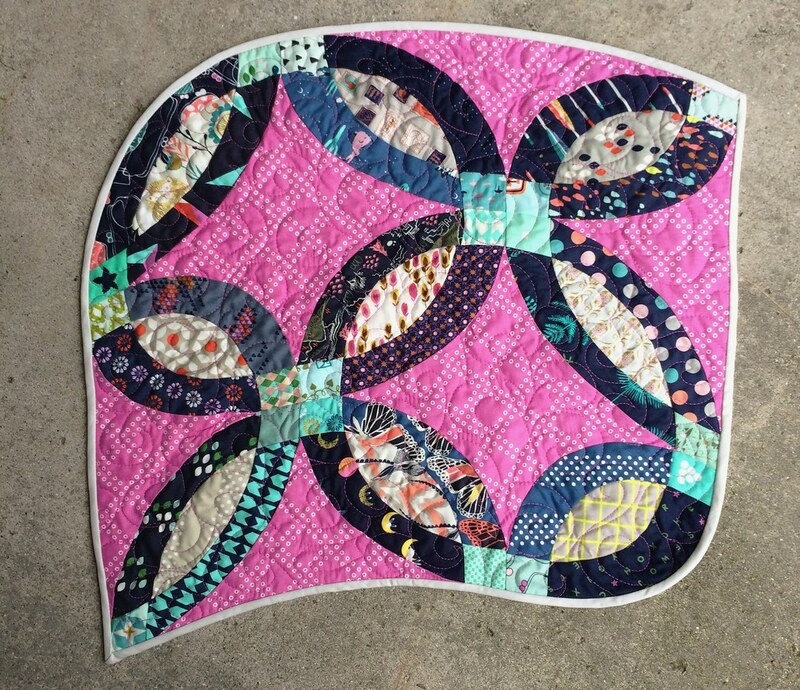 I did some cute swirls for the quilting, in a pink thread that matched the background. I used a very light gray for the binding, a little bit of quiet on a busy quilt. This is the best picture I have of the other one, though it's all clips and unburied threads! 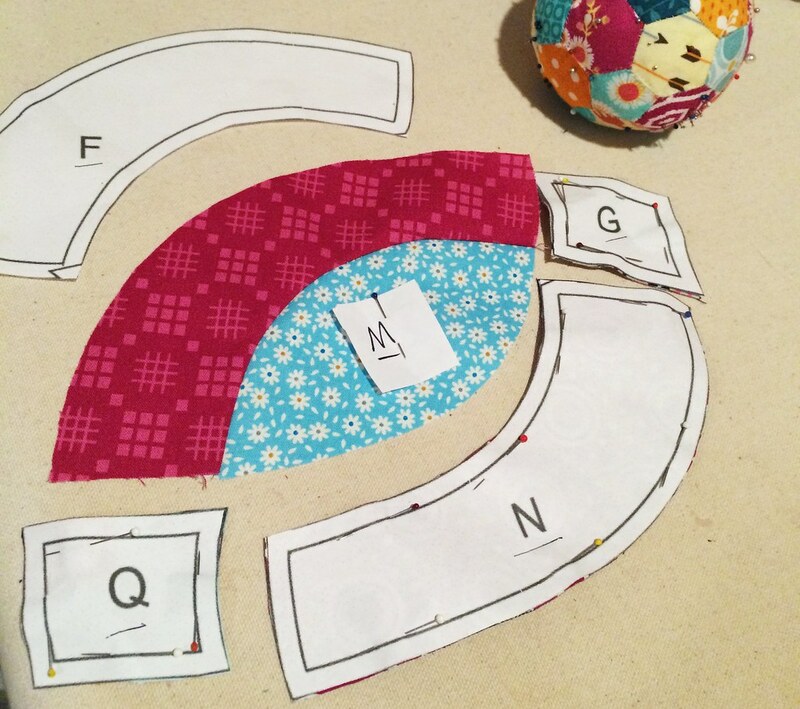 I invented a new free motion quilting pattern to quilt it's background, interlocking rings! and did specific patterns in the pieces rather than my usual overall quilting. I have to say... although I think it's amazing when others do this, I'm more inclined to stick with single pattern quilting, because it's easier and I'm essentially lazy. But, it's good to try new things just to figure that sort of thing out. But if you're asking for a pattern, I don't think one is forthcoming! I did save all my pattern pieces, I think I may make another if I can think of something more exciting to do with the pattern. Post with that quilt's proper picture is here. Very interesting manipulation of shapes. I like the non-square outer edge too.